Just me, myself, and my snake tat reporting in from Ubud, Bali. I have been here two weeks today and happy to report that I am safe and sound and doing well in this land of magic and synchronicities. I have been pondering how best to share my experiences and have decided that rather than writing linearly about my journey, I will tell the story through my affirmation cards. My cards are serving me well and I’ve been pulling one every few days to help me tune in and listen to the message it has to offer. 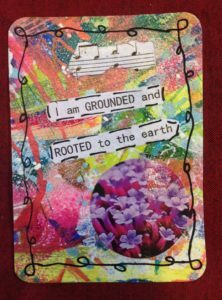 My first affirmation – “I am grounded and rooted to the earth” was much needed as when I awoke on my first morn, I realized I was not in Kansas anymore. One of my intentions for traveling alone on this trip was to put myself in an environment where I really needed to rely on myself, on my brain, and my desires. No running to the husband when something goes wrong, no one to blame, no one to whom I have to share decisions with – I am totally responsible and beholden to only myself for the upcoming 54 days. Being here for such an extended period of time warrants some different grounding rules as I’m not here so much to be a tourist but rather here to pause, be still, spend time by myself, and tap into my soul’s desires while being immersed in a culture full of warmth and spirituality. My first days then dealt with practical matters of getting a sim card, finding the best bank to retrieve money, figuring out groceries, and getting the lay of the land. Ubud is a city of 30,000 with a small central district akin to Christchurch’s CBD (central business district). The central area contains streets named Arjuna, Monkey Forest, Hanoman and the like and are dense and filled with shops, lodgings, hawkers, car taxis, motorcycle taxis, tourists, locals, random dogs and squawking roosters which all seemingly pulse together with perfection like a giant amoeba floating in the vast sea. I have been surprised at my ability to enjoy this rhythmic cacophony. I am staying on the outskirts of the central district bordering the neighborhoods of Penestanan and Sanggingan. I spent countless hours researching where to stay and tuning in to what my body wanted from this particular trip for there is a vast range of price and services from which one can select. I was guided correctly to my little apartment which is nestled within a Balinese family compound called Toko Toko Bungalows and once in through the street frontage area, it becomes a tranquil and serene place of respite overlooking rice fields. I am in a two unit building on the ground floor with a bedroom and dining/kitchen area, both with French doors that open onto a little garden and from where I can see the large swimming pool and rice field. The owners of this unit are Americans who built and own the building but lease the land from the Balinese family. I’m paying US$40/NZ$60 per night which is on the expensive side and I am here for 4 1/2 weeks. My local contact here, a woman by the name of Nyoman, comes by daily to see what I need, to have a quick chat, and help me with anything. 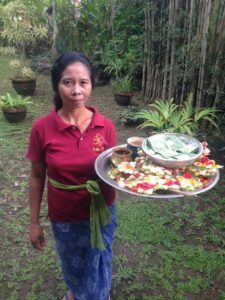 There is also a young gardener that comes daily to sweep up the falling leaves and flowers and one of the local family members comes each morning with the offerings called canang sari. The land is lush and ripe with fruits; bamboo grows to enormous heights; and the trees are amazing with their hanging roots snaking their way to the earth. Below are some photos of trees in the Penestanan tunnel and surrounds. I have settled in well in my first days – I’ve grounded down and made myself an altar, am doing my daily meditation & prayers, and am enjoying being in silence and in nature. 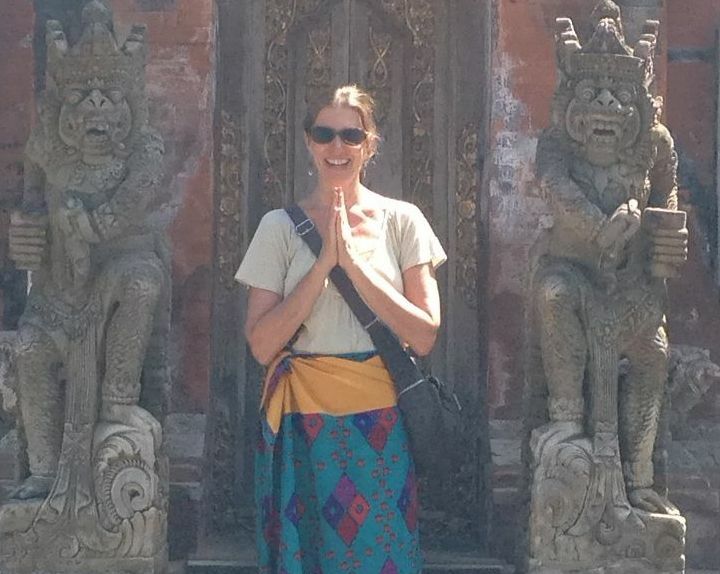 I’m feeling rooted to this beloved goddess earth – Pachamama and grateful to have this opportunity to be in Bali. The money here is called Indonesian rupiah (IDR) and $1USD = 14,000idr / $1NZD = 10,000idr. Not a lot of places take credit cards so you need to have cash. And the maximum amount of cash you can withdraw at an ATM is $3 million rupiah which is the equivalent of approximately $200USD/$310NZD. Most ATM’s max out at $1 million rupiah so it took a bit of googling to find where I could retrieve more at a time. It’s a bit of a brain game to start thinking of transactions in hundreds of thousands or millions of dollars! I don’t quite have the hang of it cause my body goes ‘aaahhhhhhhh’ every time I’m spending $200,000IDR or more (which is really only $15USD). If you’ve every fantasized about rolling around in millions of dollars, here’s where you can actually do it! 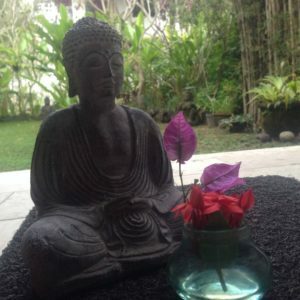 I found this website full of great introductory information to Ubud.